Dirza bike cargo rack is make of quality aluminum alloy,super lightweight but large load.It's designed for people who looking to carry a load but don't have mounting spots. It's also designed for the one who looking for bike cargo rack for long distance touring.The W-shaped bars effectively prevent the backpack from hitting the tires When you are cycling. 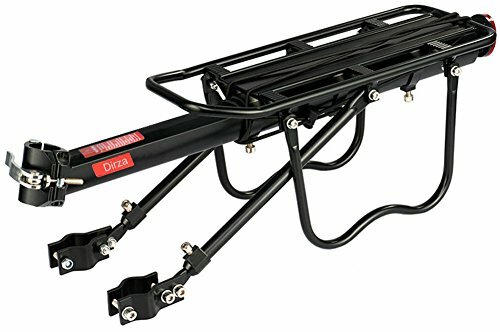 If you're looking for a strong rack,this bike cargo rack is your best choice. If you have any questions about this product by Dirza, contact us by completing and submitting the form below. If you are looking for a specif part number, please include it with your message.